Dave Prentis was yesterday declared re-elected as leader of UNISON, the UK’s largest public sector union, amidst allegations of ballot rigging, in face of a call by one-third of the union’s national executive committee for his suspension and with a public petition calling for an independent inquiry and the election to be re-run. One candidate has now issued a legal challenge to the election with the Certification Officer who is responsible for statutory functions relating to trade unions and who could order a re-run of the election. This is one of the toughest election that Dave has had to fight and it is very important that Dave is delivered, as I have said before, that not one of the others is capable of running the union, quite frankly. Sources suggest that there was initial opposition from some quarters to the suspension of Linda Perks because it was feared that she might provide evidence that could be helpful to the challengers to Dave Prentis. There has also been concern expressed at the choice of Roger McKenzie, an AGS, to conduct an investigation into the recording. Roger MacKenzie had been touted as a candidate for general secretary in this election but is said in the end to have given Prentis his tacit support. He was also the person who previously headed a disciplinary panel which issued a final warning to Heather Wakefield, the main and only female challenger to Dave Prentis, for an alleged “offence” for which, if it was an offence at all, would have been expected to result in a verbal warning at most. The true motivation for the charge is alleged to have been to rule her out of the election for general secretary. 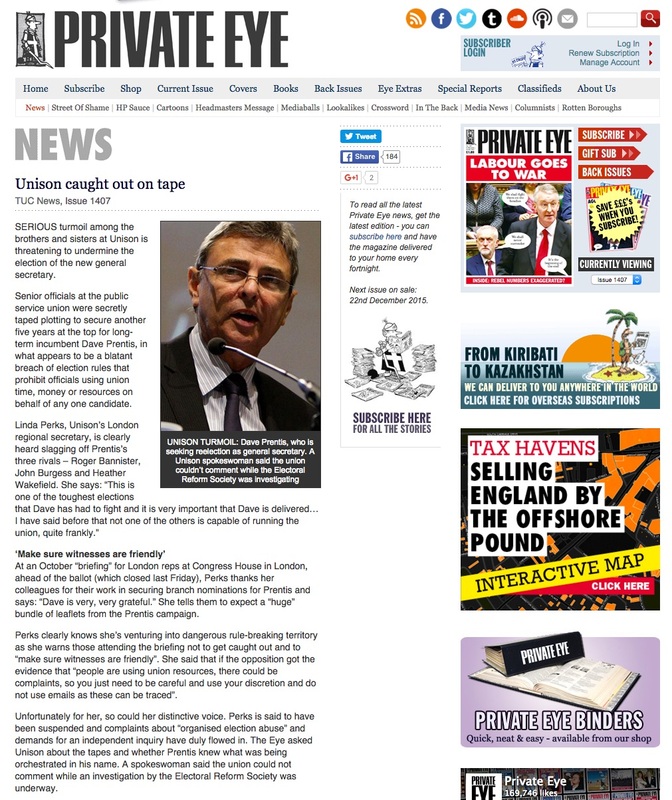 Remarkably, this controversy has attracted virtually no press coverage, something that would certainly not have been the case had such allegations been made within Unite. Yesterday the Guardian published a story headed “Unison head faces leadership challenge from the left” (itself odd on the day the result was due) which did eventually cover the controversy once the reader had read through the information that was several weeks out of date. Prior to that, the news had appeared only in Private Eye and on some far-left sites. Most reports today (such as that at LabourList which is part-funded by Unison) ignore any reference to the controversy though it is covered by the Morning Star. Dave Prentis 184,769 votes (75.6%). Posted in: Activism, Politics, Trade Unions. If it can be proved that correct voting procedure was not adhered to and David Prentice was aware of this or possibly involved, he should be excluded as a candidate for the re-run and depending on his involvement, suspended from the union. Aside from internal issues which I do not understand the most important issue for us in all this and in all union elections arises from the level of engagement of the membership. To reduce the turnout from a previous election from 15% to 10% suggests that backward rather than forward steps have been taken. It is now getting essential that many more union members be brought into support of the union at some modest levels. This weakness is far too exposed to the Lib – Con -(some) Lab Alliance MPs for undermining the case for working people’s representation. Yes, Unison is in something of a mess in my view despite it’s very large size (as an ex-member of it, and before that a NUPE steward). There has been an ongoing witch hunt against left activists with expulsions etc. for many years under Prentis, although this seems to have lessened recently (perhaps because there were not many left activists left?). It is dominated far too much by the full time officials, and got far too complacent in local government where it is now getting into difficulties with attacks on facility time and the threat of ending check off of subs. In fact I would go so far as to say that for its size it is one of the least effective unions out there. Don’t knock the full time officials, the union would have failed years ago without them. Fair point, except that I assume it would have to be the FTO’s that are running the disgraceful hostile poaching campaign in the civil service against PCS following the sweetheart deal Prentis made with Francis Maud as I can’t imagine there are any Unison lay reps there to do it? I’ve no idea about that, though you could be right. You have to bear in mind that FTOs are often in a precarious position and some senior managers happily remind them of it. It’s part of the bullying culture Prentis has failed to address. 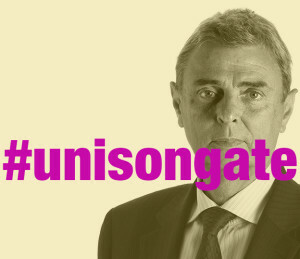 Unison is failing. Frontline staff have been cut and cut again while a new tier of senior staff have been created. As far as anyone actually doing anything for members can see the role of these assistant gen secs is a complete mystery. And here we are facing the Trade Union Bill and there’s no strategy except a small group looking at how to change from payroll deductions to direct debit. Ffs. How much does Prentis get paid? Whatever it is it’s too much as the union has floundered under his rule. Good grief, Bickerstaff was bad enough! Ask any frontline staff over a few drinks and the level of demoralisation will depress you. The only thing keeping Unison afloat is the dedication of a few devoted staff. That has to be the most accurate, most intelligent and most articulate summation of the current situation viz-a-viz Unison, (but also of the UK trade union movement more broadly as well,) that I’ve read anywhere. But then many people also feel as I do; that Unison and the other trade unions, (but also too the various professional bodies,) operating within the NHS and local government have also been tainted and inescapably damed by their involvement and association with, (and inevitably,) by their participation in, the, “appalling suffering of many patients,” that happened at Mid Staffs as described in the Francis report. Yet the union members; staff and all the other people here who had to have been perfectly well aware of what was going on and who must have seen it with their own eyes daily, remained mute and complicit. So were were the unions and so on? Similarly here in the rotten borough of Oldham Oldham our local CLP have nominated yet another sticky fingered crook as our parliamentary candidate, (or if not actuality crook, certainly a man less than scrupulous about his finances and about discharging his personal and professorial responsibilities; once again, if he didn’t know he should have done,) and yet another closet Tory. He was elected by 60% of those who bothered to vote, but then only 40% of those eligible even voted at all, so roughly only around 20% of the people of Oldham even voted for him and yet we’re all suppose to embrace him as our MP. Ill confess that I’ve largely lost interest in Left Futures since Micheal Meacher’s death and also following Labour’s completely abject decision, (if only by by default,) not to oppose yet more expensive and pointless bombing by the UK mostly of the already sick and wounded, of the civilian populations of North Africa and the Middle East, of old men and old women, of families, of mothers, fathers and their children and babies very few of whom are actual active combatants anyway. good man is dave prentis,have alot of respect for this man. Dave Prentis has been general secretary of unison during a massive attack on the public services by Tory governments with thousands of jobs lost and mass privatisations. However, the profile of UNISON, the country’s second largest union, has been minimal in the press. Dave Prentis is like Mr. Anonymous, only coming out as a ‘fighting man’ in the run up to the election. We need new blood at the top of this vital union, someone with charisma, someone willing to go all out to defend the public sector. Dave is not that man. he is not a strong leader. The methods used to get him re-elected were dubious if not in flagrant violation of UNISON’s own rules. Also interesting to note (but unthinkable less than a year ago) every single candidate in the election, right, centre and left, claimed to support Jeremy Corbyn. These are interesting, if often confusing, times! Desperate but very typical cries of dirty tricks by the ‘losing left’. Not surprised by the low turnout: have a look at the TU leadership elections of the last 10 years- they are derisory. Even “the great” Red Lens 2013 UNITE victory of 144000 to 80000 was on a turnout of 15%. The union movement is clearly in terminal decline and that’s yet another reason for them to have less not more involvement in internal Labour Party affairs. That said Dave Prentis is an oasis of practical common sense. Watch for his ilk (‘democratic Left’) to gradually retake control of Labour over the next 4 years. The DL saved Labour from the loonies before: they will again! Not a good advert for Trade Unions, but allegations of voting rigging would come naturally fro the extreme Left candidates, who are more used to that sort of thing. Prentice was the Anti Lefty Candidate so no wonder he got 75% of the Vote on a ridiculously low turn out. Results on low turn outs below 50% should be ruled invalid, and the whole Election run again until that figure improves. Its not as if voting is made all that difficult for members, so what exactly don’t they understand about democracy?